﻿ Visiting the Philippines on $40 a day. A wide-eyed guide to a country of surprises and delights. M.D.S.Prabu is a freelance travel writer based in Singapore. 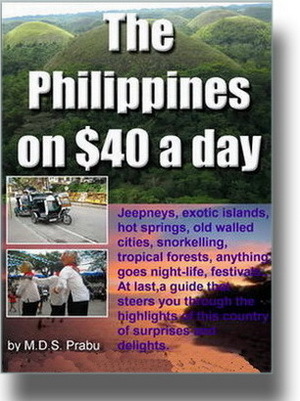 And his book outlines a forty day tour of the Philippines with a motley crew of compatriots. Prabu examines everything from the price of a ferry ride to the transsexuals at White Beach. He investigates the history and cuisine of the country, it's jails, museums, tattoo parlours, islands and types of accommodation. This is a lively account from a wide-eyed correspondent of a country that often clashes with his conservative Indian perspective. If you're thinking of travelling to the Philippines, Prabu's fresh take on the country is good value. And the many photos add spice.